“A group of friends went swimming one day and one of them lost a ring in the bottom of the lake. Everyone started diving from different directions to find it until there was so much mud and sand stirred up that no one could see anything. Finally, they decided to clear the water. They waited silently on the edge of the shore for the mud from all their activity to settle. When it finally cleared, one person dove in slowly and picked up the ring. When we are confused about something in our lives, we will often hear answers and advice from all directions. Our friends will tell us one thing and our families another, until we feel pretty well mixed up. If we look away from our problem and let patience and time do their work, the mud inside us will settle and clear. Our answer will become visible, like the glimmer of silver in the water.” – Today’s Gift by Anonymous. 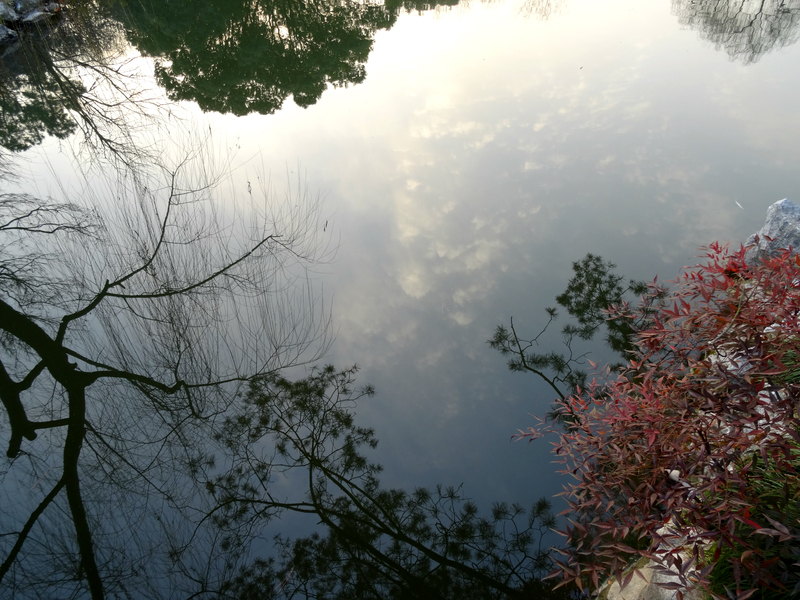 Shot this picture of a beautiful lake, in Hangzhou,China. January 2014. Like the sun, sky and clouds, Love has always been there for you–though you have it not in your hands. I just got back from a two week Silent Retreat in Chiang Mai, Thailand–the land of the Flying Lanterns. It has been an epic Spiritual Journey through the inner labyrinth of my being, with many twists and turns that led to the centre of my soul. I faced my Fear of Fears and the two monsters from the land of Me-Me-Me and Perfectionism. Instead of running away, this time, I said hello and embraced them openly. I saw the sadness and emptiness in their eyes. All they wanted was Love. All they needed to know, is that despite how unlovable they seem to appear to be, at all times, they are Loved. All along, the lonely Me-Me-Me “monster” belonged in the land of We. All along, the Perfectionism “monster” just needed a pair of new eyes, made in love and of love, to see I’m Perfect in the word Imperfect. And so, I learnt and am learning still, to tame my inner fiery dragon by befriending the beast within. To kiss my inner frog and not to be afraid of my own shadows. All along, we are a bit of darkness, a bit of light. On the last day of the Silent Retreat, after breakfast, on the way to the laundry to collect my clothes, I stopped at every path where the sun shone, to catch the sunlight. Off the path, I spotted a burst of sun rays gleaming through the trees of the labyrinth. It was a detour, but I headed straight in its direction, breathing in the sun and exhaling to see my breath, like a puff of smoke, evaporating in the chilly cool morning air. Like a child, I went about catching sunlight with my hair, my skin, my eyes. Then, all of a sudden, this Question came to me like a poem: Can you catch the sunlight? Can you slice a sky? Can you bottle up a cloud? It is there, for you, though you have it not in your hands. So why must you hold Love in your hands to believe you have Love? This stopped me right in my tracks. I was aware I was being gifted with another Lesson, in Love. And as I pondered it, a smile broke across my face. My Teacher was still with me, loving me with another gift of Truth. …I looked down at both my hands and saw that I wasn’t holding my pouch with the alarm clock! I forgot to bring a watch to the retreat. So I borrowed an alarm clock from someone and placed it in the pouch, that was loaned to us by the spirituality centre. I cannot afford to lose them both! Plus, I needed the clock to keep time so I won’t be late for our gatherings! So I half-ran back to the laundry room to look for it, but it wasn’t there. Raced to the dining hall’s table where I had breakfast, but it wasn’t there. Desperate, I even went looking in the rubbish bin–but it wasn’t there! On the way back to my room, it occurred to me that I might have slung it on my left wrist. I looked beneath the piles and piles of clothes, sure enough, my pouch was right there! Hah! Lesson: What I thought was lost, what I went searching for, was always there with me–all along. If, like me, you’ve been searching high and low for a Love that was lost and came back empty, perhaps it’s time to reconsider that maybe what you thought was lost, is still with you. That what want, is already yours. We feel the need to hold, touch, and see Love in our hands to believe it’s real, as evidence that we’re loved. Could we begin to See through the Eyes of Faith that at all times, we are Loved? Love comes in many ways and forms, and it begins by recognising first and foremost that Love is you, is yours, is within–and is with you. Like the sun, sky and clouds–Love has always been there for you. The process of waiting for the one, for two to become one, begins with enjoying your relationship with the One. It is how you can feel truly embraced within, with Love, even in moments of silence and solitude. And so, I learnt and am learning still, to tame my inner fiery dragon by befriending the beast within. To kiss my inner frog and not to be afraid of my own shadows. All along, we are a bit of darkness, a bit of light. Half “angel”, half “devil”. And yet, through all the bad, our Creator sees so much good in us, and has so much Faith, Hope and Love in us, for us. …I looked down at both my hands and saw that I wasn’t holding my pouch with the alarm clock! I forgot to bring a watch to the retreat. So I half ran back to the laundry to look for it, but it wasn’t there. Went back to the dining hall’s table where I had breakfast, but it wasn’t there. Desperate, I even went looking into the rubbish bin–and it wasn’t there! And so today, I share this little piece of my journey with you, as a reminder that LOVE is with you. Immanuel is with You. Always will be. If, like me, you’ve been searching for Love in all the wrong places and came back empty, may this serve as a reminder that what you thought was lost or have been looking for, has always been with you, is yours. Have Faith. Have Hope. That LOVE transcends the form of a boy-girl relationship. If you are not in a relationship right now, it doesn’t mean you are not loved or lovable. Our whole purpose on earth is to Be Love and to Be Loved. Love comes in many ways and forms, and it begins by recognising first and foremost that Love is you, is yours–and is with you.